At the 2015 Hombu Dojo New Year's mirror-opening ritual ceremony, Hiroaki dojocho was promoted to 7th dan. People promoted to 7th dan received their certificates directly from Doshu Ueshiba Moriteru Sensei at his residence. 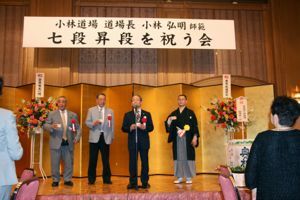 Almost immediately, people in charge of the Tanashi, Fussa and Tachikawa Dojos along with the Instructors group began planning to have a celebratory party, to be held on March 21st (the first day of Spring) at the Palace Hotel in Tachikawa from 6 pm. The Instructors group issued me a formal invitation requesting my presence by no later than 5:45; whoever was in charge seemed concerned about the smallest detail. I arrived with my brother at the Palace Hotel at 5pm, a little early. The registration tables were just being set up, so we were shown to a waiting room by Kodaira Dojo's Manami Akiba, who was scheduled to take her 3rd Dan test the very next day on the 22nd. She had been practicing very hard for the test and had injured her back, so was glad to see her walking around. She was taking her responsibilities so seriously and was trying so hard, I had to bow to her (in thanks). About five minutes before the scheduled opening of the party, we were escorted downstairs to the registration area where I saw so many guests chatting in the wide lobby. There were nearly 200 people in the Palace Hotel's grand ballroom, its biggest event hall, by 6:00. 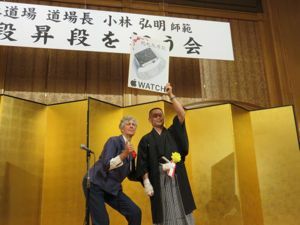 The MC for the occasion was Yuji Kasahara of the Instructors group. Hiroaki dojocho's unconventional entrance was on the back of a prancing horse created by Johnnie, a 3rd Dan from Tokorozawa Dojo, Mr. Yasuda, a 1st Dan of Tachikawa Dojo and Mr. Asai, a 1st Dan of Tanashi Aikidokai, with Hiroaki dojocho's sandals being carried by uchideshi Recip. Because of this unexpected entrance, the hall erupted in sound. Before the speeches began, Fuchu Dojo member, internationally well-known Shakuhachi master, Christopher Yomei, performed an original arrangement of a pack-horse driving popular ballad that lent a degree of solemnity to the festivities. Manabu Masuda, an instructor and Dojocho of Masuda Dojo started his opening speech with a very serious face it seemed, but went on to read his speech smoothly. As the guest of honor, I had been invited to give a speech. Kobayashi Dojos motto is to always keep the speeches short. I talked about Hiroaki Dojocho as I flipped through a series of photographs that included Hiroaki Dojocho on the beach at the Iwai beach camp, Masuda Shihan, when he was a 2nd grader, practicing with Hiroaki Dojocho, and Aikido Kobayashi Dojo 15th Anniversary celebration at which we gave a father-son demonstration. The next speech was by the Gumma Aikido Federation head Arai Shihan, who began practice in Hombu Dojo at the same time I did, in 1955. 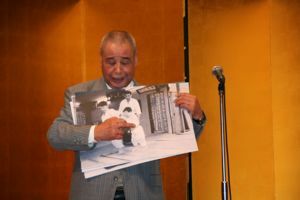 Arai Sensei will also be handing over his dojo to his son, who attended the celebration in Tachikawa along with his father. An ex-Diet member and civil administrator in the Foreign Ministry, an old friend, Mr. Suematsu, gave the next speech about his friends working in various foreign countries as ambassadors who can help us in case of any trouble. Next on the program, the instructors presented a barrel of sake and the toast was given by Shihan, Shirakawa who is the head of Sendai Shinburenseijuku and who was present at the opening ceremony of Aikido Kobayashi Dojo, at that time representing the Aikido Club at Meiji University. The festivities were under way. Other participants in the celebration included representatives from the Hassamu dojo of Hokkaido, Fukushima Prefecture's Tokojuku shihan, Oshiyama, Gumma Aikido Federation representatives, Manazuru Aikido Juku's Okubo shihan, from the Aizu Aikikai, Oki shihan,,, Kyoto City Aikido Federation Takane shihan,, Kyoto Nagaokakyo Dojo's Mr. and Mrs. Oda, and many more from affiliates as well as friends of Hiroaki dojocho's. There was great food to eat and all the sake we could drink as I circulated greeting people—ladies in beautiful kimonos, young mothers with their kids—talking with everyone; it was a wonderful time. Mikio Kobayashi shihan, performed magic and Yuji Kasahara did a dance which sent everyone into laughter. 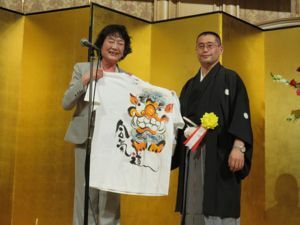 Ota Shihan, presented Hiroaki dojocho with a T-shirt, dojo members gave flowers, after her speech, Barbara Shihan, handed Hiroaki Dojocho a colorful certificate for the new computer watch. 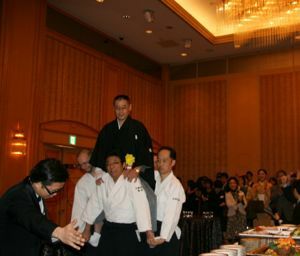 Like this, so many people came to congratulate Hiroaki dojocho on his promotion to 7th dan. To close, Ishimura Shihan, of Fuchu Dojo led the traditional three handclaps. I am sincerely grateful to everyone who attended the celebration and hope to see everyone practicing in Aikido Kobayashi Dojo. Special thanks to all the people involved in planning the memorable event.